������ Trat is Thailand’s eastern-most province, located about 315 kilometers from Bangkok. This small province borders on Cambodia with the Khao Banthat mountain range forming a natural demarcation. With 52 large and small offshore islands, long white sandy beaches and unspoiled coral reefs, Trat offers delightful scenery and a tranquil hideout for nature-lovers. The province also serves as a major fruit-growing and fishing area. he city of Trat is a starting point for Ko Chang island group or forays into outlying gem and Cambodian markets. Those enthralled by shopping will be delighted as Trat has more markets for its size than almost any other town in Thailand due to Cambodian coastal trade. From Bangkok, take Highway No. 34 (Bang Na-Trat) or Motorway to Chonburi, then use Highway No. 344 (Ban Bung-Klaeng) Arriving at Klaeng, turn onto Highway No. 3 and proceed to Trat. The total distance from Bangkok to Trat is 318 kilometers. Both air-conditioned and non air-conditioned buses depart from Bangkok's Eastern Bus Terminal (Ekamai) to Trat every hour from 6 a.m. to midnight. From Bangkok the buses to Trat cost 169 baht for 1st class air-conditioned buses (132 baht for 2nd class) and 197 baht for 24-seat VIP air-conditioned buses or 113 baht for regular buses. The trip takes five to six hours by air-conditioned bus or about eight hours by regular bus. From Chanthaburi to Trat, the regular bus takes about 30 minutes. If one goes by taxi from Chanthaburi to Trat, it takes around 45 minutes. Sam lors around town should cost about 10 baht per person. Small song taews cost about 5 baht per person on a share basis or 20 baht to 40 baht for the whole vehicle. This village is approximately 8 kilometers from town on the Trat-Laem Ngop route. It is noted for Ngop Nam Chieo, a native hat to ward off the sun. The hat, which is still widely used today as it is light and comfortable, is woven with local palm leafs grown in mangrove area. In addition to the traditional shape, it has been adapted into other more fashionable shapes as souvenirs. On beautiful trees and with breathtaking views, you will experience new sensations never felt before. From one platform to another…from tree to tree… balance yourself through an assortment of games such as rope bridges, tarzan swings, flying skateboards, and giant zip lines. No matter how old you are, you will enjoy hours of fun and excitement. Our mandatory briefing will teach you how to use the slings, carabiners, pulleys, and harnesses safely. Plus, our adventure course is made, maintained, and certified by French experts. Join them to take an adventure with total safety in the beautiful forest of Koh Chang, Thailand. Tree Top Adventure Park was created by Little World Co., Ltd., a company formed by a transnational group of individuals who love to travel and appreciate the unique activities that the world offers. As they are nature admirers, they also go ape over tree climbing. Their French experts have brought the know how and techniques to do this activity safely and with special care for the trees you climb. Enjoy rope and harness tree climbing so much and want to share the fun activities and amazing views that can experience from the top of the trees. It does not matter how old you are- their assortment of rope bridges, tarzan swings, and giant zip lines will bring you hours of fun and excitement. This temple, which is also known as Wat Bot, is located on Tetsaban 4 Road near the city pillar. With fine murals in its former Ubosot, the temple was once used as the site for the government officials' oath of allegiance ceremony during the reign of King Taksin. The rite was shifted to Wat Phai Lom by King Rama V.
Located on Lak Muang Road, the City Pillar stands in a Chinese-style building. Erected by King Taksin, it is a highly revered edifice for the townspeople. This is a bay with fine sandy beaches that are popular with the local people during holidays. It is 4 kilometers off of Highway No. 3156 (Ban Saen Tung-Laem Ngop). This island is the farthest island from the coast of Trat. Its size ranks it as the fourth largest island in Thailand or the second largest island next to Ko Chang in Trat. The island, which is 25 kilometers long and 12 kilometers wide covers an area of approximately 105 square kilometers or 65,625 rai. Its natural features include mountains and plains where many streams originate and become waterfalls. One famous waterfall is Nam Tok Khlong Chao, which flows throughout the year and is an ideal place for swimming as it is comprised of 3 tiers; of which the upper two tiers are running streams and the lower one is a large pond. In 1911, King Rama VI paid a royal visit to this waterfall and named it 'Nam Tok Anam Kok' to commemorate Ong Chiang Su. In addition; there are beaches with crystal-clear seas which are popular among visitors such as Taphao Beach, Khlong Chao Beach, Khlong Hin Beach, Phrao Beach, etc. Accommodations with a private atmosphere is available for visitors at the inner sea of Ko Kut, and the other two islands, Ko Rat and Ko Mai Si, opposite to Ko Kut. Package tours including accommodation (on Ko Kut, Ko Lao Ya and Ko Ngam) as well as return fares are usually offered. Those wishing to charter a boat can contact the Laem Ngop landing or make advance inquiries at the Ko Chang Centre Point at Tel: (039) 538055, 538059). There are boats from Ko Chang to Ko Kut three times a week (Tuesday, Thursday and Saturday). Please ask for the departure times of the ferries from Laem-Ngop Pier to Ko Kut at the pier. The island is rather flat compared to Ko Chang with the highest mountain on the island, Khao Phaenth, measuring 315 metres. It has a good number of wonderful beaches with crystal clear water (Ta Pho Beach, Khlong Chao Beach, Thakian Beach, Phrao Beach etc.). Inland, the island is very wild with a lot of coconut and rubber tree plantations located in the plains. The best time for a visit to Ko Kut is between beginning of November and the end of February. At this time it is relatively cool, dry and mostly sunny. But until the end of May, when it is hotter than the cool season, a visit is still convenient. Even during monsoon season, Ko Kut is worth visiting for it doesnt rain every day and all day long. Some of the more expensive Resorts on Ko Kut offer Banana-, Donut-boat-trips and water-skiing. In addition visitors can do drop line fishing at the beaches and bays or rent a boat over night (about 3000 Baht) in order to try night time fishing. The village Aow Salad (Baan Aow Salad) in the Salad Bay (Aow Salad) is located in the northeast part of the island. It is the biggest fishing village on Ko Kut fresh seafood can be bought every day. The marvelous waterfall Nam Tok Khlong Chao or Than Sanuk Waterfall, which was visited by King Rama VI in 1911, is one of the most beautiful spots to be found on Ko Kut. It consists of 3 tiers: the upper two are running streams and the lower one is a large pond - an ideal place for swimming. Ko Wai, this small paradise is situated approximately 6 kilometers south of the southernmost end of Ko Chang The island is about 3 kilometers long, in the widest point 1.5 kilometers and has some very beautiful sandy beaches. Ko Wai is reached daily by a boat starting at 3.00 pm from the Laem-Ngop-Pier. The travel time is 2.5 hours and costs 130 Baht. This is a large island to the south of Ko Chang that is blessed with several beautiful bays and beaches and coral reefs nearby that are still in perfect condition. The islanders make their living by growing rubber and coconut trees. The best time to visit is from November until late April. There are a number of accommodations and tourist facilities available. A passenger boat departs Laem Ngob daily at 3.00 p.m. and returns from Ko Mak at 7.00 a.m., traveling time is 3.5 hours. This island is situated to the northeast away from Ko Mak. In the past, the area had an abundance of Kradad trees (paper trees); hence, the name of the island. This island is notable for the fact that it is the only island in Thailand to be issued a land title deed during the period of King Rama V as a measure to protect the island from French colonization. 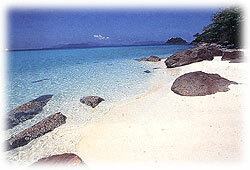 Ko Kradad is famous for its white long sandy beach and wonderful coral reefs. This island is located near Ko Mak and is endowed with natural wonders such as crystal clear seas, chie sandy beaches, coral reefs and most importantly, tranquility and privacy. Ideal for swimming and diving, the trip to Ko Kham from Laem Ngob takes 2.5 hours. Covering an area of 429 square kilometers, Ko Chang, boasts several amazing natural wonders that blend magnificently with the traditional way of life such as 70 percent undisturbed island rainforest, steep hills, cliffs, waterfalls, and notable wildlife, fine beaches, coral reefs and an abundance of marine life. In addition, numerous fruit orchards dot the island. As well as the obvious activities Ko Chang offers many other attractions including waterfalls, temples, the National Park and Museum or the beautiful scenic lookout points, which are all worth a visit. Divers will find fascinating diving areas off of the shores of Ko Chang and the surrounding islands. Besides the many coral reefs, sunken warships, a reminder of times past, can be visited in the Salak Phet Bay. The Ko Chang National Park occupies an area of 650 square kilometers and is comprised of 47 islets, which spread from Laem Ngob to Klong Yai Districts. . The most popular islands includes Ko Chang, Ko Klum, Ko Ngam, Ko Lao Ya and Ko Rung where natural wonders await travelers. The most popular season for traveling to the National Park is from November to March. The park headquarters are divided into 4 units namely Tha Than Mayom, Ban Khlong Son, Tha Khlong Plu and Ban Salak which provide useful tourist information. At any one of the headquarters, an entry fee of 200baht is collected. For transportation to Ko Chang, please refer to the traveling to Ko Chang section. This area is located to the south of Ko Chang close to Salak Petch Bay. It is the area where the battle between the Thai and French Naval forces was fought over the eastern border conflict. The Thai Navy holds an annual event to commemorate the combat victory and make merit for the dead naval forces on 17 January. Located to the south of Ko Chang, approximately 3 kilometers from Ban Salak Petch. One of the longest beaches on Ko Chang, this beach provides the most magnificent seascape. The beach, which is 2 kilometers long, is dotted with reasonably priced bungalows and resorts. Embracing the beach to the rear are orchards of coconut trees and forests. Rich in coral lines, the bay is located on the western coast of Ko Chang where Klong Son Community is situated. The main thing to do when in Ko Chang is to relax. Other than that, there are numerous activities for visitors such as fishing, snorkeling and visiting nearby islands. In addition, many resorts rent out kayaks and arrange jungle treks as well as provide all day boat tours to the nearby islands. Moreover, scooters can be rented in most places, which make the island easier to explore independently, however the driver should have some two-wheel experience as the roads have a tendency to fade away to nothing more than tracks. There are many resorts and bungalows on Ko Chang thus visitors purchasing boat/ferry tickets from any of the piers should inform the staff of the desired beach and resort accommodations reserved to prevent misunderstandings on the destination. Facilities on Ko Chang include mainly bungalow-type accommodations on most beaches which generally rent out bicycles and boats. Budget and high-end accommodations are also available with prices ranging from 100 baht (bungalow) to 6,500 baht for superior/deluxe rooms in boutique hotels and internationally accredited resorts. Ko Chang is still virtually an untouched gastronomic paradise as the islanders have made a living fishing in the beautiful blue seas for centuries. There are plenty of seafood restaurants dotted around the island and with the recent addition of a number of resorts, visitors can now enjoy a wide range of local and international cuisines. A 5 hours bus trip from the Eastern Bus Terminal will take visitors to the Trat Bus Terminal (departures between 06.00 a.m. until 12.00 p.m.). From there continue by song taew transport to Laem Ngop, which is 17 kilometers from town, or the ferry landings at Ao Thammachat and Ko Chang Centre Point where services are operated all day. Passenger boats usually leave from Laem Ngop to Ao Sapparot on Ko Chang every hour from 8.00 a.m. until 5.00 p.m. The trip takes 45 minutes and the fare is 50 baht per person. Visitors can continue to Hat Sai Khao, Hat Khlong Phrao and Hat Kai Bae by local bus which charges 30 baht per person. The schedules and fares are subject to change without notice due to climate condition. For current information, please contact TAT Trat office, Tel: Tel: 0-3959-7255, 0-3959-7259-60 Fax: 0-3959-7255. Ferries depart either from Ao Thammachat or Ko Chang Center Point Landings between 7.30 a.m. and 4.30 p.m. with a traveling time of 30 minutes. Private vehicles can be loaded onto the ferry. Please note that vehicles used on the island should be the 4-wheel drive types as road conditions are bumpy and there are steep slopes to be negotiated. From the landing on Ko Chang are song taew services to various points. Fares should be settled beforehand. For visitors planning to stay at Ko Wai there is a ferry service from Laem Ngob to Ko Wai at around 3:00 p.m. with a fare of 120 baht/person/one way. For visitors planning to stay at Ko Kham there is a ferry service from Laem Ngob to Ko Kham at around 3:00 p.m. with a fare of 170 baht/person/one way. For visitors planning to stay at Ko Mak there is a ferry service from Laem Ngob to Ko Mak at around 3:00 p.m. with a fare of 150 baht/person/one way. Facilities on Ko Chang include mainly bungalow-type accommodations on most beaches and rental services for bicycles and boats. Several smaller isles south of Ko Chang include Ko Wai, Ko Lao Ya and Ko Kradat. Noted for both deep-water and shallow-water corals are the Ko Kra group and Ko Rang which are to the west of Ko Mak. Most visitors come to Amphoe Laem Ngob where there are 2 piers namely Laem Ngob and Ko Chang Centre Point, offering daily boat services to islands such as Ko Mak, Ko Wai, and Ko Kham. Tourist spots in Ko Chang and other groups of islands. Wat Thong Thua, 4 kilometres from town on Sukhumvit Highway, is the site of an ancient Bot which was built over a Khmer-style temple. It also has a large collection of ancient Khmer sculptures such as lintels, sandstone door columns carve in various designs and inscription stone. Nearby is the Mueang Phaniat archaeological site with its remains of laterite base of a large Khmer religious sanctuary and moats marking the town limit the south. The ancient town is believed to have been dated from the 12th-16the centuries B.E. (Buddhist Era). This temple is a Dharma-practicing facility amid the cool shade of forests and fruit orchards. To the south of the temple is what is called the Khao To Mo Ancient Site where piles of stone pillars have been discovered. It is believed that they were components of ancient Khmer structures. In addition, a large number of relics such as pottery and ornaments and beads were found at the site. Wat Saen Tum can be reached by taking the Saen Tung-Bo Rai route. At Km. 18.5, take a left turn to head for Ban Tha Lai, Ban Na Makham and Ban Erem where the temple is situated. The temple is about 38 kilometers from Khao Saming district. The Khao Lan Thai Red Cross Centre on Trat-Khlong Yai Highway at Km. 48 was formerly a facility to assist Cambodian refugees who fled the fighting in their country into Thailand from 1978 until peace was restored in 1986. After the refugees were repatriated, the centre was closed. Today, the site has been adapted into a tourist facility. Tel: 0 3952 1621. This quiet beach is at Km. 59 of Highway No. 318 (Trat-Khlong Yai). On Lak Muang Road, this is an old 3-story building that was once used as the residence of the French governor when the town was occupied in 1904-1907. Subsequently, from 1928, it became the residence of Trat's governors. The Ko Chang Yutthanawi Memorial, at Laem Ngop, commemorates the Franco-Thai naval engagement on January 17, 1941. Other attractions at the memorial include the Statue of Prince Chumphon, father of the Thai navy, and a warship-shaped museum displaying old equipment and armaments of the fleet with exhibits on the Ko Chang naval battle. This small island at the west of Ko Mak does not have enough flat area suitable for setting up of any resorts and bungalows. However, Ko Rung is well known as the location for its birds nest concessions, sea turtle eggs and bat's dung. The main attractions at the island are the stone knolls and the magnificent deep-sea corals. This island situated in front of Salak Petch Bay has clean and calm seas, and is cool and shady with coconut trees. Travel time from Laem Ngob is two hours. Accommodations are available on the island. This island is situated southeast of Ko Chang and is comprised of twin mountains linked by huge rocks with a huge sand knoll at the middle. The little bay formed by the lines of the mountain stretching into the sea makes the island a splendid and serene site worth visiting. Accommodations are available. This wonderful island which is less than 1 kilometer long and 300 meters wide with beautiful beaches, crystal-clear water and colorful corals lies about 3 kilometers west of the southeastern end of Ko Chang. Ko Laoya forms an island group with Ko Laoya Klang and Ko Laoya Nok and is connected to Ko Laoya Klang by a wooden bridge. Travel time from Laem Ngob to the island takes about 2.5 hours and only chartered boats can reach the island. Accommodation is available but must be reserved well in advance. Like Ko Chang, this is an island of historical significance during the Thai-French Naval Battle in 1941. Attractions on the island include the stone yard landscape and fishing activities. Ko Chang Noi and Laem Chang Noi lie to the north of Ko Chang. The sea between Ko Chang Noi and Laem Chang Noi is abundant with corals. - กรุงเทพ-แหลมงอบ (ตราด) รถออกจากถนนข้าวสาร 08.00 น. แหลมงอบ-ถนนข้าวสาร รถออกจากแหลมงอบ เวลา 11.00 น.